Officer safety is one of the main focuses at BlueSheepdog.com. Here are some of the law enforcement training articles we have published over the years. There are even more in the blog, just type in the officer safety topic which interests you into the search box on the right. Backup Gear: Two is One, One is None – Aaron examines the concept of having a backup of all of your gear: guns, flashlights and more. Bail Out Bag – A BOB or “go bag” is vitally important for officers responding to in progress calls where they may need additional tools, supplies or ammo when they are away from the car. Care Under Fire: Lifesaving Measures for Patrol Officers – Even if you don’t know what TCCC is, Richard breaks down the basics of saving your own life if wounded in a gunfight. Domestic Terrorism: The Threat is Real – Don’t think it can happen where you work? Think again. Emotionally Disturbed Person: The EDP – Officer safety tips for dealing with people in an altered mental state, in emotional crisis or under the influence of a drug. Flashlight Tactics – The first in a three part series on the use of flashlights in patrol work. Flashlight Tactics, Part II – Part two of three in Aaron’s series of articles on flashlight tactics for law enforcement. Flashlight Tactics, Part III – This is the final installment in this series on tactical use of white lights. Four Simple Fight Winning Techniques – Winning a fight is a lot easier when you enploy one or more of these simple techniques. K9 Handler’s Officer Safety – Experienced K9 handler Randall takes a look at how to maintain officer safety when working a dog. Newhall Shooting – This officer safety training article and video takes a close look at the multiple officer murder from more than 40 years ago. What did we learn and are we making the same mistakes today? Peroxide Based Bombs – Get the truth on what a peroxide bomb can, and cannot, do. Police Knives: Carrying and Training – The first in a four part series on carrying a blade on duty. Police Knives: Folding Knives – Randall looks at the usefulness of a folder for police work. Police Knives: Neck Knives – Some officers carry them as a deep-concealment, last-ditch weapon. Randall gives us his take on these blades. Pre-Attack Indicators by Lt. Jim Glennon – Wondering if that guy you are talking to is about to attack you? Glennon gives you the signs of an impending attack. Reaction Time – Police Shooting Study – The results of this study on reaction time are not encouraging, but they do give us something with which we can improve our training programs. Responding to Crimes in Progress – Officer safety tips on responding to in progress calls. Six Things That Can Save Your Life – Richard gives us a list of six specific things we can do to make the job safer. Tactical Patrol: Mindset – “Get your mind right” was the frequently yelled phrase at my academy. Aaron works to get our minds right when it comes to going on patrol in this officer safety series. Tactical Patrol: Response to Critical Incidents – In this part of the tactical patrol series, Aaron looks at specific critical incidents including domestic violence, suicidal subjects and barricaded subjects. Tactical Patrol: The Patrol Rifle – The patrol rifle is a key piece of safety equipment for law enforcement officers. Aaron talks about the rifle and its deployment on duty. Tasers Are Not a Deadly Force Option – Sadly, officers are trying to use tasers in deadly force situations. Richard shows us the harsh penalties for making such a mistake. Ten Deadly Errors – Never heard of the 10 deadly errors? You must read this article right now. Threat Identification in Low Light – Most law enforcement shootings happen in reduced light conditions. Can you properly identify a threat in these conditions? The information in this article may surprise you. Traffic Stop Safety: Calling Out the Stop – The first in a four part series offering practical officer safety advice on traffic enforcement. Traffic Stop Safety: Exiting the Patrol Car – Getting out of your car on a traffic stop seems simple, but Aaron offers specific tips on how to do it safely. Traffic Stop Safety: Patrol Car Placement – There is much debate on how to position your patrol car during a traffic stop. In this article, Aaron examines three different placement locations, plus offers an alternative for commercial vehicle stops. Traffic Stop Safety: Use of Light and Movement – The final installment in Aaron’s series on traffic stop safety. Traffic Stop Safety Tips – Richard offers specific tips for traffic stops in a concise officer safety article. 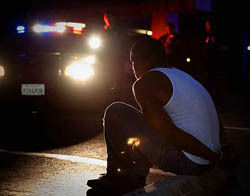 Traffic Stop Survival: Tips for Police Officers – Additional officer safety tips for conducting traffic stops. Using Ballistic Shields in CQB Environments – A very in-depth article on the use of body bunkers and other shields for SWAT teams when clearing a building.